Port Barton is a fishing village between Sabang (where the Underground River is located) and El Nido. It will take you ~5 hours by boat and ~4.5 hours by van to get to El Nido. By Van: Wagas Coop has one van going from Port Barton to El Nido every day. It leaves at 8 am and arrives around 12:30 pm. The van will drop you off at the El Nido Transport Terminal. The return trip from El Nido to Port Barton also leaves at 8 am in the morning, and arrives at 12:30 pm in Port Barton. By Boat: Ask your hotel for assistance in booking a boat to El Nido. Be sure to protect your belongings because they may get wet! The boat will drop you off at the El Nido port. Once you’re at the El Nido Bus Terminal (or the Port), take a “tricycle” (a retrofitted scooter with a sidecar that can seat up to 4). Ask the tricycle driver to drop you off at Deli Nido. 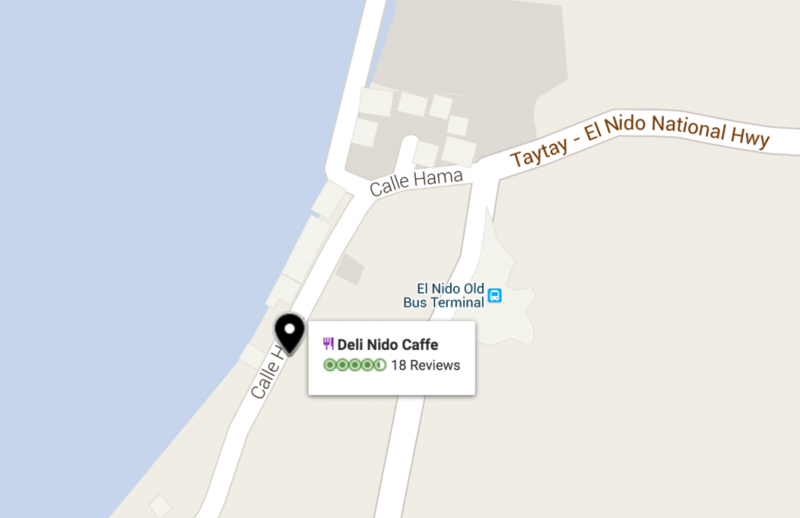 Deli Nido is a cafe on Calle Hama, the main street in downtown El Nido (Calle Hama runs along the beach and has a bunch of resorts on it, such as El Nido Beach Hotel, Rossanas Cottages and Entalula Cottages- the cafe is across from Entalula Cottages). If the driver doesn’t know where it is, just tell the driver that it’s near the old bus terminal! Here is a map. The tricycle trip from the bus terminal should take about 10 – 15 minutes and cost around 50 pesos. Deli Nido will give you a free iced coffee, and call us so that we can pick you up in our tricycle! Our workers will load your luggage in our tricycle, and then drive you to our resort. It’s a short ride (about 5 minutes); we recorded a time-lapsed video of the trip, to give you a sense for it. If you would rather walk the path to our resort, you can just go north along an access road, past an oceanfront bar to your right (El Nido Corner), past the Barangay hall to your left, past a cemetery to your left, and then past a number of resorts on your left and right. It’s about a 10-15 minute walk.